Richmond Park is a National Nature Reserve. We want you to enjoy cycling in the park, and to make sure you have a safe and trouble-free visit. Before you are allowed to take your hire bike out into the park we will check your bike with you to ensure that it is in good working order. In particular we will check tyre pressures, brakes and steering. Once complete you will be shown a copy of the safety guidance and made aware of the Park’s regulations before being asked to sign for the bike hire and to acknowledge all of the above. To help us, please follow the safety advice below, use the Royal Park's Code of Conduct and abide by the Parks Regulations (see link). We are not obliged to provide a recovery service - it is the customer’s responsibility to return the bike to the Parkcycle unit should you have a breakdown or puncture. However if we are not busy then we will endeavour to assist you if you call us on 07968 697541. We will add additional time to the hire time to compensate for any time lost. Please do not call 999 in this instance! If you have an accident as well as phoning for any required emergency services please also let us know directly by calling 07968 697541. If you have an accident or emergency please inform us by calling 07968 697541. Oak Processionary Moth: Summer, is the time of year when the caterpillars of this invasive Moth are on the move and may be found low on the trunk and branches of oak trees, where they may also form webbed nests. The hairs of the caterpillars carry a toxin which can be a threat to human health, causing skin rashes, eye irritation and respiratory problems. The Royal Parks aim to minimise the risk to the public and full information can be found here. Ticks and Lyme Disease: Lyme disease or Lyme borreliosis, is a bacterial infection spread by infected ticks. Human infection is uncommon, because only a small proportion of ticks have the infection. Ticks can survive in many places but prefer slightly moist, shady areas such as bracken, bushes and leaf litter. They can be found in both long and short grass. Ticks can't jump or fly, so they have to wait until an anima (or human) brushes past to attach to their skin. The tick population peaks between late spring and autumn (April to October). Full information can be found here. Deer SafetyThe deer in Richmond Park and Bushy Park are wild animals and can be unpredictable. Our parks are nature reserves and the herds of wild deer roam freely. Help Phones for the Police are located at various points around the park (check park maps for locations; Roehampton, Richmond and Kingston Gates as well as Holly Lodge and Isabella Plantation). Below is an extract of the Code of conduct for cyclists, roller skaters, roller bladers, skate boarders and visitors using other foot-propelled devices in designated areas – see this document for full details. 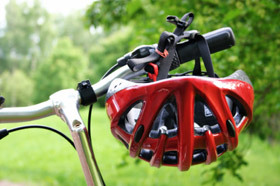 For full details and advice on regulations and cycling in the parks please click here. Be considerate – Pedestrians have priority over all other users of pathways and shared pathways, even in areas designated and marked for other purposes. You are asked to use these pathways considerately. Other users may not be aware of you, please remember this when passing. Be safe – We recommend you wear British Standard approved protective equipment and ask that you adhere to all pathway and road markings. Our pathways are not suitable for fast travel, so please keep to a sensible speed. If you are in a hurry, you may wish to use another route. Be seen & heard – Some park visitors may have a visual or hearing impairment, using a bell and or wearing high visibility clothing will help others to be aware of your presence. Be polite – Thank other park visitors who allow you to over take or pass them. Full details of the parks regulations can be found here.